Graziella is thrilled and honored to have captured the crown of Ms. United States 2008! 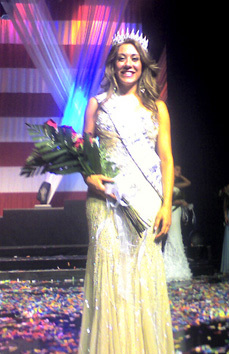 Graziella represented New York at the national pageant in Las Vegas, Nevada from July 12- 17, 2008. She is no stranger to pageantry, as she has held the Miss New Jersey United States 2004 and 2005 titles, as well as Miss Bergen County NJ 01 & 03, and Miss Middlesex County NJ 02 titles in the Miss America Pageant. Although Ms. Baratta has faired quite well in pageantry, what she honors most are the opportunities that pageants have afforded her. "Pageants are truly a rewarding experience for young women, enabling them to expand their horizons and promot e issues dear to them, as well as opening doors of opportunity in their careers and beyond." Graziella is a triple- threat performing artist, choreographer, and a dance & fitness instructor, as well as an image consultant and graphic/web designer. With her sister Liana, the Baratta sisters offer personal and corporate image consulting through their company brand B.YOUneek. As a performer, Graziella has been seen on stage for regional and off- Broadway productions such as FAME! The Musical, on MTV, Billboard LIVE, at Madison Square Garden and is working on productions with her dance company G-Volution, such as their original musical, "Puttin on the G" which debuted off- Broadway in September 2007. See Graziella's performing artist website at www.graziellabaratta.com. Ms. Baratta has volunteered for many charitable organizations over the years, and is truly dedicated to touching the hearts of others by sharing her talents with as many people as possible. Graziella's official platforms are Healthy Habits for Life and I aM for Women.